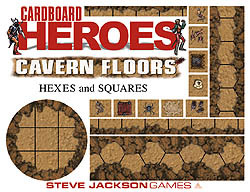 Cardboard Heroes: Fantasy Set 1 – Player Characters features 40 adventurers, ready for the dungeon, castle, or battleground of your choice. Cardboard Heroes: Fantasy Set 2 – Brigands, Orcs, and Goblins features an assortment of brigands and fantasy foes, ready for the dungeon, castle, or battleground of your choice. 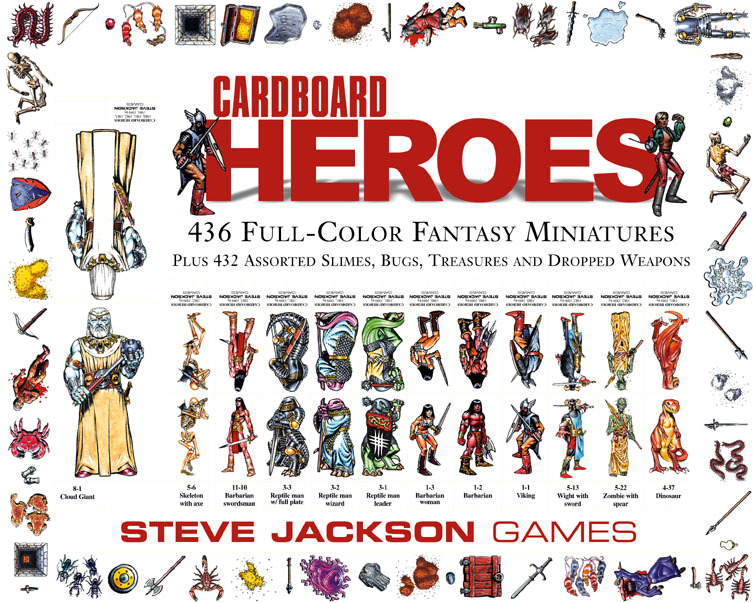 Cardboard Heroes: Fantasy Set 3 – Half-Orcs, Reptile Men, and Kobolds features 40 humanoid monsters. Will they be friend, foe, or just bystanders? Cardboard Heroes: Fantasy Set 4 – Animals features 48 animals, from mundane snakes to giant insects, from dogs and cats to polar bears and bigfoot. Cardboard Heroes: Fantasy Set 5 – Undead features 40 formerly living creatures. From the mindless zombies and skeletons to the dangerous and powerful liches and vampires, this set features enough monsters to fill the graveyard and the dark, deserted castle . . . with enough left over to field a necromancer's army. Cardboard Heroes: Fantasy Set 6 – Monsters I features 40 beasts, constructs, and humanoids. Need a golem made of bronze, rags, stone, or crystal? How about a minotaur, Neanderthal, or werewolf? This set has all these, as well as blobs, insect men, hobgoblins, gargoyles, imps, harpies, and even a cockatrice! Cardboard Heroes: Fantasy Set 7 – Monsters II features 36 more creatures for any fantasy game. From classics like elementals, giant bats, and Medusa, to variants like wereboars, wererats, werebears, and weretigers, to more unusual creatures like octopus warriors, living weapons, and satyrs, this set delivers figures for all kinds of encounters. 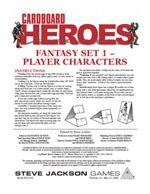 Cardboard Heroes: Fantasy Set 8 – Giants features 15 oversized humanoids. From the mighty titan to the nearly human-sized ogres, this set has the figures you need to bring "Fee! Fie! Foe! Fun!" to your minis gaming. 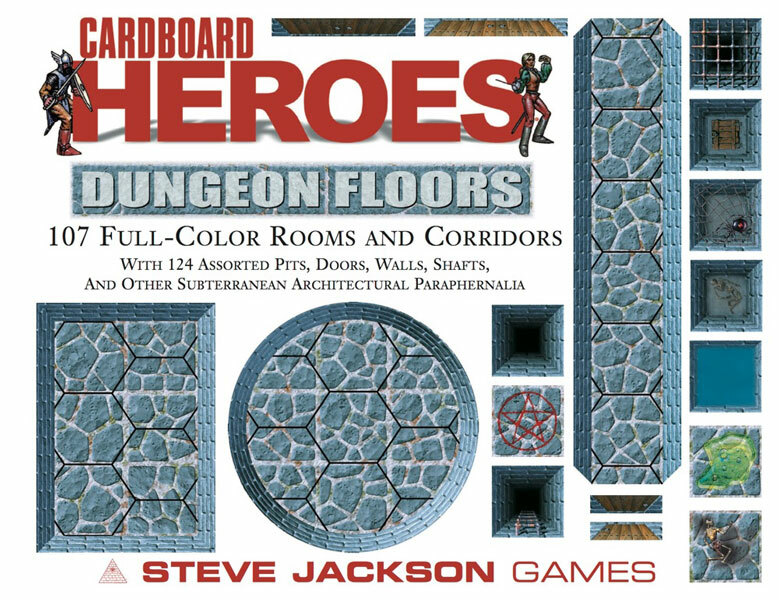 Cardboard Heroes: Fantasy Set 9 – Dungeon Dangers features insects, birds, bats, slimes, and enough creepy crawlies to bother the bravest of underground adventurers. 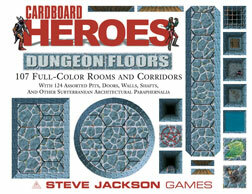 Cardboard Heroes: Fantasy Set 10 – Traps and Treasures features counters with all types of dungeon goodies. There's the good: weapons, baubles, treasure chests, gold, and other loot. There's the bad: treacherous pits, pressure traps, and doors in the floor probably leading to new perils. And there's the ugly: corpses and skeletons, no doubt the bodies of those who've fallen prey to the dungeon dangers. Watch your step! Cardboard Heroes: Fantasy Set 11 – More Player Characters features 40 more options for miniature representations of the party's heroes, with Vikings, nobles, clerics, halflings, gnomes, dwarves, and more! Feel free to use them to depict noteworthy NPCs . . . we won't tell. Cardboard Heroes: Fantasy Set 12 – Japanese Characters features 36 options for iconic medieval Japanese adventurers, from a magic-wielding shugenja to samurais . . . peasants to nobles . . . police officers to yakuza. And, of course, there are ninja. Ninja are everywhere. Cardboard Heroes: Fantasy Set 13 – Dragons features all six stages of a red dragon's life, from dragon eggs to small, medium, and large wyrms. And the less said about the truly fearsome giant red dragon figure – the largest Cardboard Heroes miniatures figure ever – the better. Cardboard Heroes: Set 18 – Car Warriors features 36 duellists, bikers, MONDOs, troopers, and the dregs of future society, for your autoduelling campaign. From knights in shining armor to punk bikers with destruction on their minds, these figures provide for a full array of encounters, for GURPS Autoduel or any other present or near-future setting. 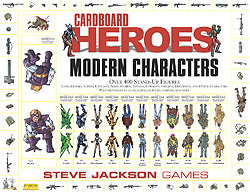 Cardboard Heroes: Cowboys and Indians features 50 full-color icons of the Old West. Options include a schoolmarm, gambler, trapper, dance-hall girl, bandit, and more! Click here for detailed information (and pictures!) of Cardboard Heroes Castles! 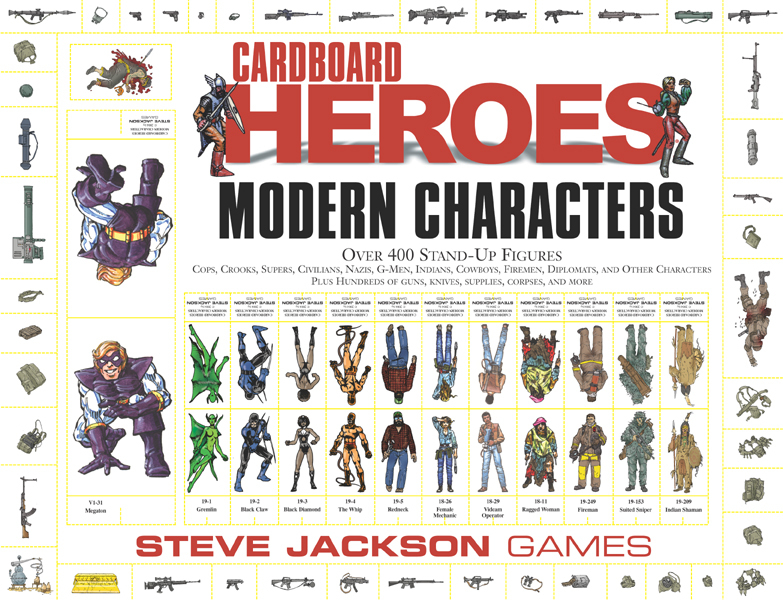 An often-requested reprint is our Cardboard Heroes line . . . beautifully drawn full-color stand-up figures. Much cheaper than miniatures, and more convenient too! We have reissued all 13 sets of fantasy-themed Cardboard Heroes in one pack, and adding duplicates of some of the "cannon-fodder" figures like orcs and undead. 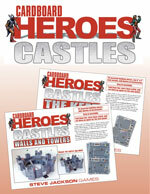 Over 400 stand-up figures, plus over 300 flat counters for traps, dropped weapons, creepy crawlers and the like! They're available in packs of 10, in eight colors (below) and assorted. 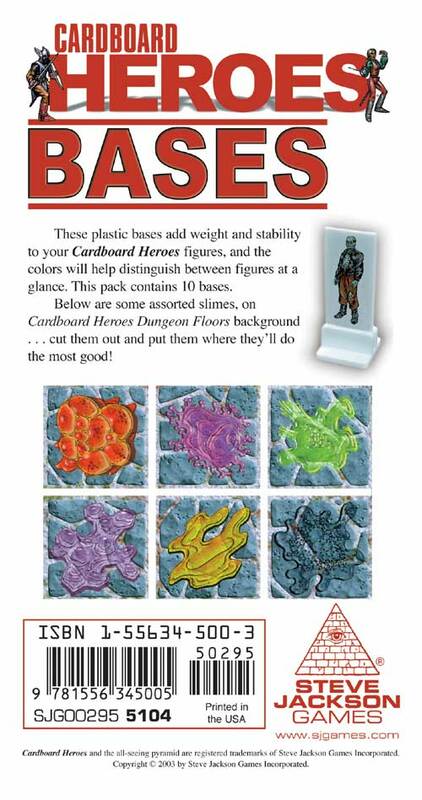 Included are some assorted slimes, on Cardboard Heroes Dungeon Floors background . . . cut them out and put them where they'll do the most good! 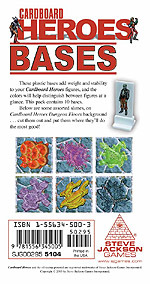 10 plastic bases and cardstock insert in a zip-lock bag.